is singing loud for all to hear! I am finally home from a wonderful time in Chandler, Arizona. I spent lots of time with dear friends, and I got to attend the best Christmas concert ever!! Thank you, Clay Aiken, for the gift you gave us for Christmas! Every note and every word was beautiful! 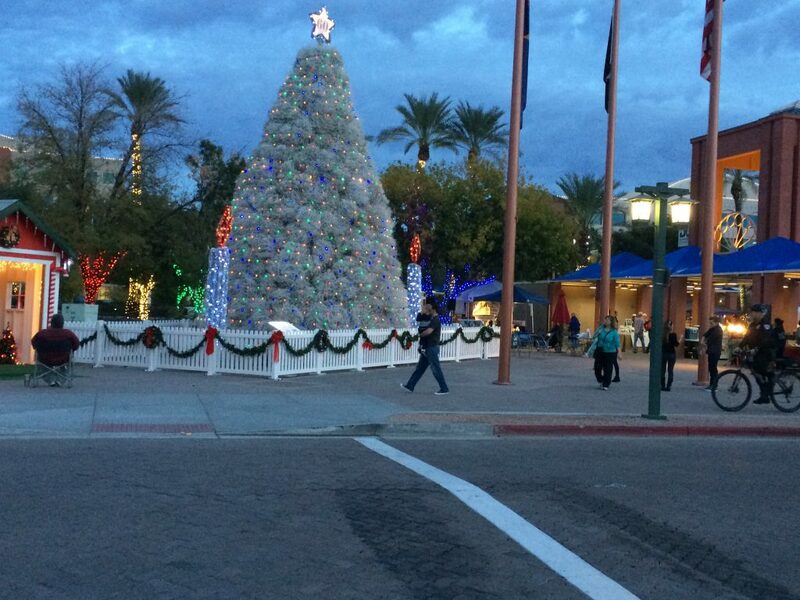 Did I show you the picture of the Tumble Weed Christmas tree that was across the street from the Hotel? In the past week, we have had two exciting appearances by Clay Aiken. On Thursday, December 15th, Clay and Ruben Studdard were guests on The View. They sang together and talked about what they have been doing since their “Wins” on American Idol. It was fun to see them singing together on TV. And…it seems the appearance was fun for the press too. So many news and entertainment sites picked up the story. The holiday season brings friends and family together — or, in the case of Clay Aiken and Ruben Studdard, two former competitors. The two American Idol alums reunited Thursday (Dec. 15) for a special duet on The View. Surrounded by a sea of tinsel and holiday decorations, Aiken and Studdard delivered a stellar performance of “This Christmas.” To make the situation even better, they wore matching red sweaters. 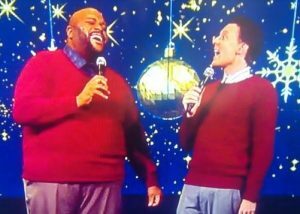 More than 13 years after competing on American Idol, season 2 finalists Clay Aiken and Ruben Studdard reunited on The View Thursday — all in the name of Christmas joy! Performing “This Christmas,” the Idol alums gave their first TV duo performance since their days on the reality competition series in 2003. They even had matching red sweaters to add to the holiday cheer! Clay Aiken, Ruben Studdard “The View” Video: Watch “American Idol” Reunion! 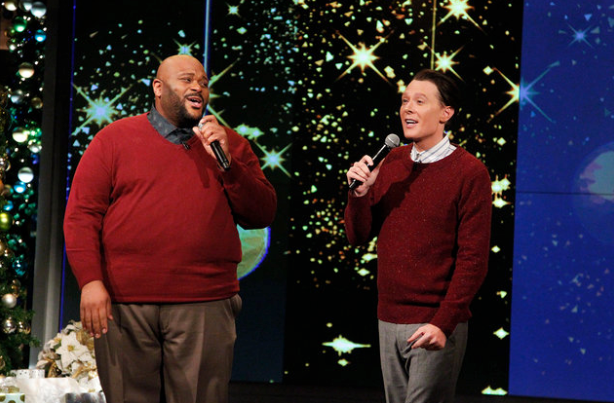 Clay Aiken and Ruben Studdard had an “American Idol” reunion on Thursday’s “The View” for a special Christmas performance. Watch below! Studdard, of course, won season two of “Idol” back in 2003, with Aiken coming in second place. But there wasn’t much rivalry between them. In fact, the two have remained friends over the last 13 years. There are many more articles about the appearance. Clay, Ruben, and The View even trended on Twitter after they sang!!! Since I posted a video of them singing on the show on Thursday, I will not post it again here. You can see it on Thursday’s blog! There has been so much social Media about Clay’s concert on Friday night. I found some wonderful YouTubes and I thought I would bring them over so you can see for yourself how great the concert was. A big Thank you to artquest for sharing the videos on YouTube!! I would also suggest that you go to Clay’s Facebook page to see some video too! CLAYSFB Just scroll down a bit and you will see them. 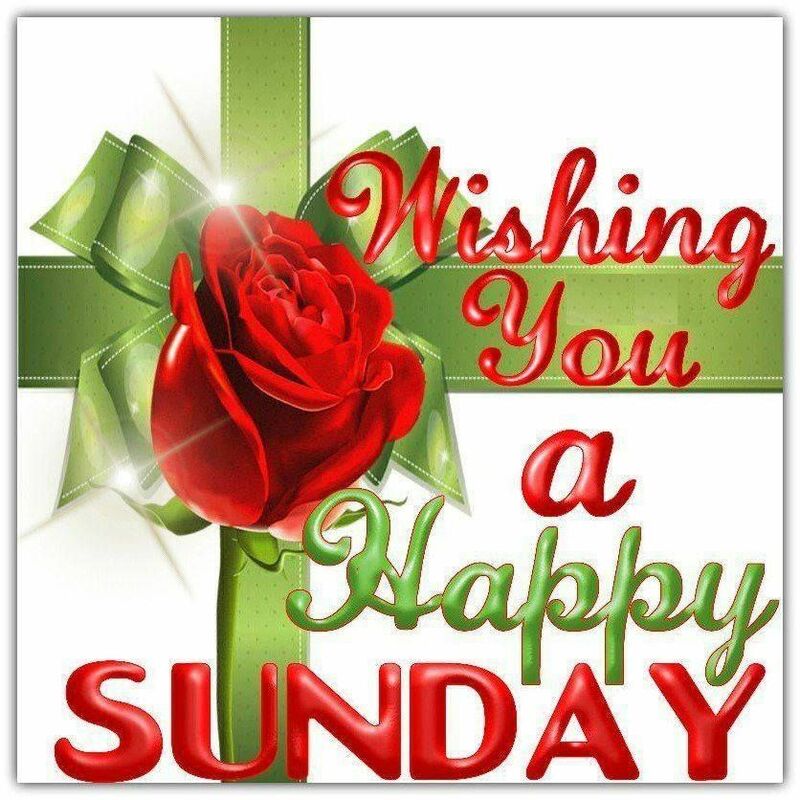 Have a wonderful Sunday and if you find something special to share, please bring it over and put it in a comment.! I was heart-broken, because I missed this concert. But thanks to all my fellow claymates, I will be forever thankful for sharing various videos and pictures! And thank you CANN for posting these videos and articles on OMC! Enjoy you every day! Can’t wait to view what YouTube has posted from the Arizona Christmas Concert. Waiting for the new posts after the concert was very hard for me wondering if all went well and what the press would say after all these years. Seems like they just made a basic report without expressing opinions. Hope good things go out about the concert. ❤️ UNCONDITIONAL love for you clay! So grateful for the folks who posted these videos so those of us who couldn't attend the concert can still share in the beauty of these songs by Clay. Wishing all of Clay's fans a Very Merry Christmas and good health in the coming year. thanks for the wonderful videos of Clay's concert! Error: Error validating access token: Session has expired on Tuesday, 21-Aug-18 16:13:01 PDT. The current time is Friday, 26-Apr-19 01:04:55 PDT.